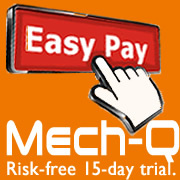 Flexible plans are available for Mech-Q! Home → Flexible plans are available for Mech-Q! Both plans offer a great way to try Mech-Q with all features enabled. Both also allow you to try the software for 15 days before making a decision. If on a subscription – you can convert it to a full license ownership and redeem up to 6 months of payments. For full licenses we offer either a one time payment or we can spread it out monthly if needed.